It’s rare that a game addresses the existence of random level arrangements. Sigtrap Games seized the opportunity the thematic context that a sci-fi setting provides and introduces their title with a backstory wrapped in the universe’s descent into a texture of displaced foam. Swatches of space are unraveling at the seams, flitting in and out of existence, slipping through nothingness to appear on the far side of a galactic core. In your scrappy clan’s hunt for the technology that pre-event societies cultivated, you find your craft whisked away along with the apparent source of localized flux storms. A way home may lie inside. Luckily, its shifting chambers are filled with killer robots and ammunition. I’d forgotten how much I enjoy flying like this. There’s immediately a sense weight and acceleration that feels good, like you’re burning through transparent shaving cream with engines primed for the task, but the vacuum is unrestrictive. A velvety deep exhaust note rises through the calm, casting you about with a tiny bit of momentum—not enough to carry you past your mark. 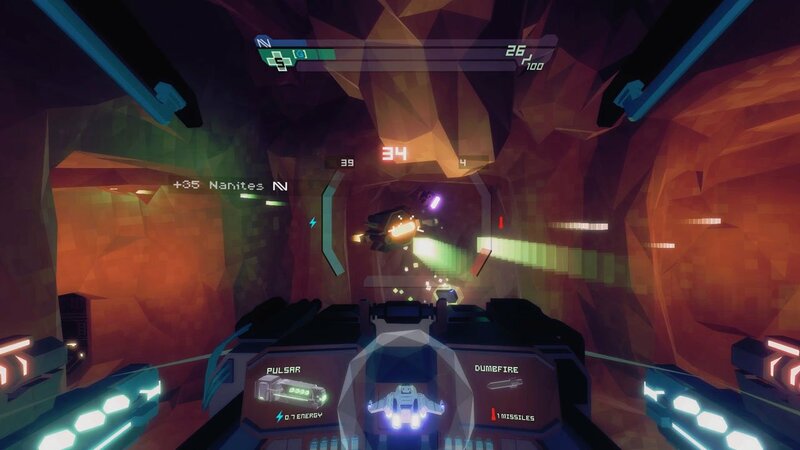 The game’s claim to the somewhat abandoned “six degrees of freedom” means supplanting the typical airplane controls with an ability to move and rotate any direction you please. It’s dizzying and delightful. Pouring punishment into automatons is similarly immediately gratifying. Weightless polygonal boxes somehow thud and shudder with mass and impact. Guns punching into their targets is a mix of effervescent light show and heavy, resonating metal. 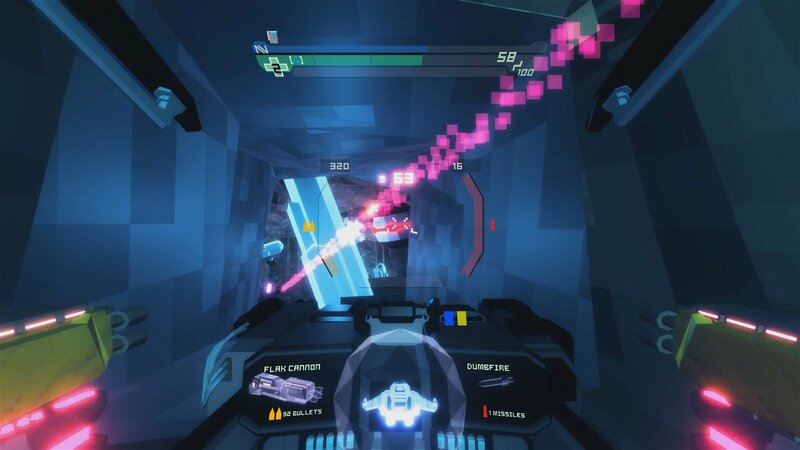 The game’s greatest strengths are that the constituent elements of second-to-second play are satisfying and that its cross of blocky objects and textures with modern, blooming visual effects harmonizes well. A memorable score of low-grade electric buzz accompanied by clear instrumentation caps off the theme of old mixed with new. With continuity of resources between stages and a lack of checkpoints comes an unfamiliar importance laid on avoiding damage. Inching closer to demise in Sublevel is a tightening vice that’ll persist past every destroyed core and through every wormhole. The echoing consequence of poking your nose too far into a chamber can lead to conservative, mousey styles of play, as charging forward with lasers flaring and lateral thrusters spitting is usually a good way to spell your eventual doom. This also means mean peak performance will always be rewarded and early vigilance will continue to bear fruit. There is reason to risk your neck, though. Valuable nanite globules released from the husks of enemies will dissipate if you let them linger, so slowly picking apart a room from the far side of a shuttering door could cost you. Collecting the specks will let you customize your loadout through combining random weapons’ statistics and behaviours and layering on passive bonuses between map generation, but they’re sometimes best ignored in favor of safety. It’s still a frequent risk versus reward prospect. You’ve got to choose your movements carefully, but greater allowance for aggressive play and maneuvering through firefights, if only occasionally, would be appreciated. I find myself missing the sense of exploration intentionally laid environments could bring, too, but is it fair to fault the game for not being something it wasn’t intended to be? My primary complaint lies with a desire for more. More variety in the size, shape, and appearance of environments, more interesting ship upgrades, more weapon types, more enemies requiring different strategies. I’m certainly not bored yet, but I wonder if my interest will be retained for the several dozens of hours this repeat playthrough type of game is capable of. Perhaps I’m being greedy. It’s held me long enough to be happily satisfied with a purchase. 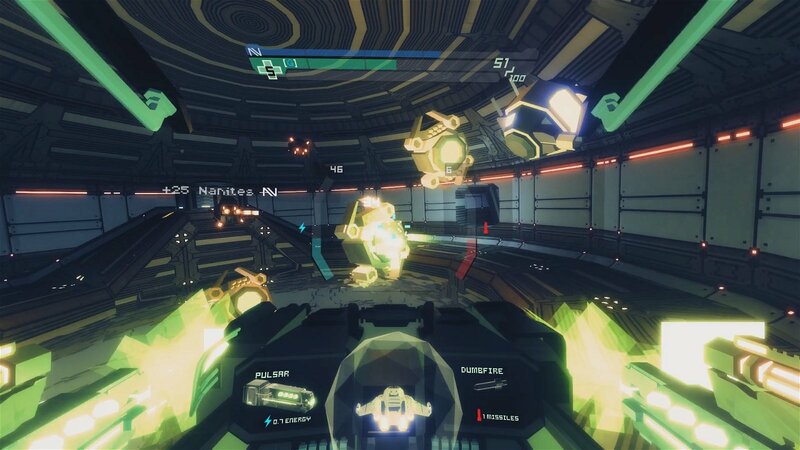 Sublevel Zero is a very welcome return to a largely forsaken genre. Fans will feel it stroking nostalgia as it flexes its interesting aesthetics and it’s fundamentals of bot-shooting are strong. I’ve had its tunes thumping through my brain—the piano riff echoed through a number of the tracks is lovely—between sessions, and it’s built to foster many more to come. Pick this one up with confidence if the promise of recapturing a specific lost joy appeals to you.